← Warning: Calories on board! Stuffed banana peppers make your grill sizzle. Dinner on the run doesn’t have to be fast-food. It can have all the appearances of a well-thought our meal, tasting and looking very “gourmet” even. I find this especially to be the case with seafood. 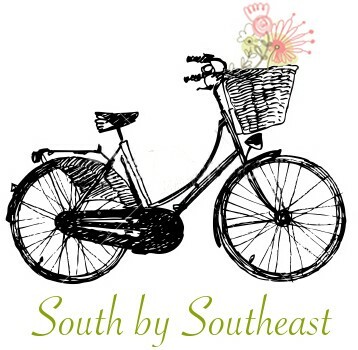 Something – pretty much anything! – made with seafood can be impressive and for the most part, the simpler the better. Good seafood doesn’t need much in the form of accoutrements. Luckily I live on the coast in an area where we have an abundance of fresh, local seafood delicacies most of the year. 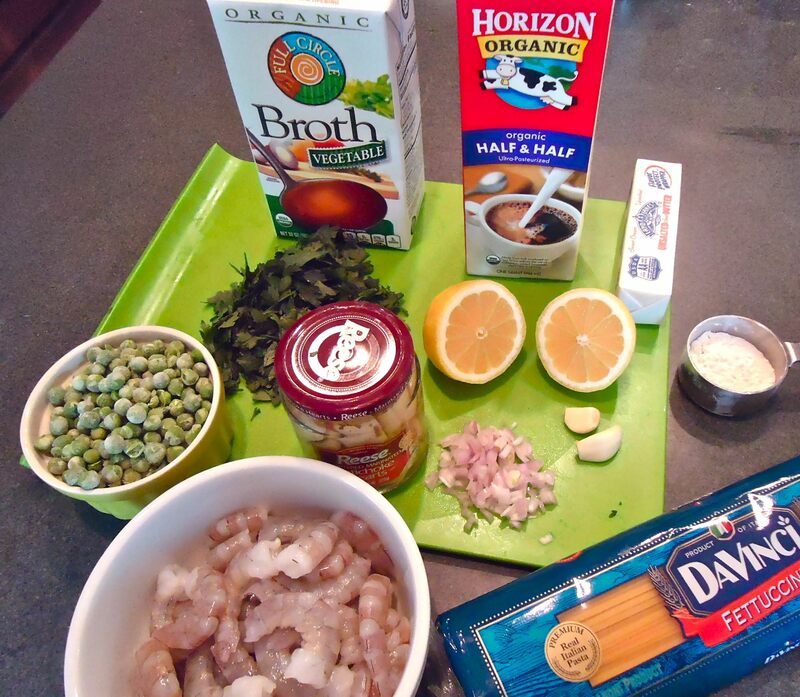 One evening a few weeks back I had all the ingredients in my kitchen to make pasta with shrimp and artichokes. The shrimp are locally caught but I had frozen them in water about 2 months earlier when we had an overabundance. And I’m not bragg’in or anything, but it was time to enjoy them as shrimp season has rolled back around again. I set them out to thaw and by mid-day they were well on their way, so they finished up de-icing in the refrigerator. I removed the shells lickety-split and I swanny if they didn’t look and smell like they were just pulled from the trawler’s net, i.e. they had no smell and they were firm but glistening with freshness. Aside from this defrosting (and never try to thaw shrimp in a microwave or under warm water. 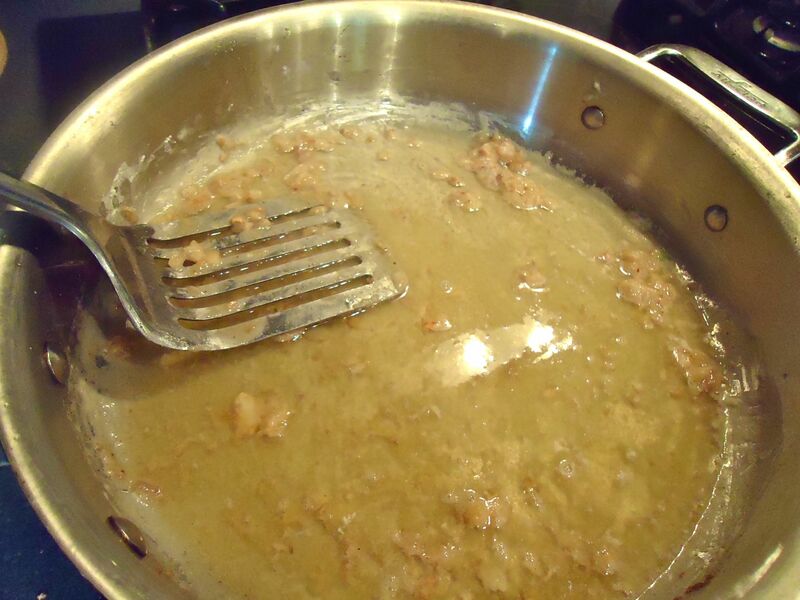 They will get cooked or worse, become host to some unpleasant bacteria) this recipe comes together very quickly once you prepare the roux and cook the pasta. Toss it up, baby! So I left the sweet Vermouth out of this picture. Sorry! I like Noilly Prat brand in the red bottle. 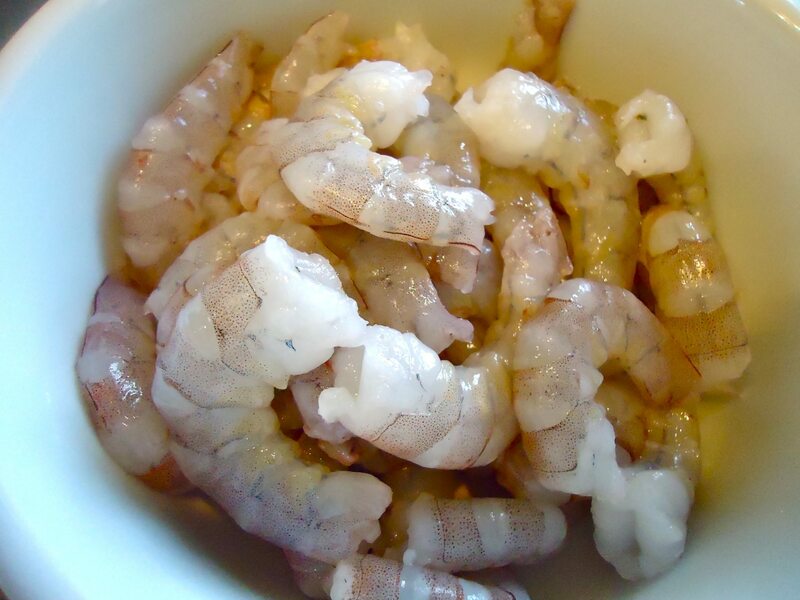 Here are the raw shrimp (prawns), out of my freezer, cleaned and shelled. Being only a pound they thawed quickly. Here are the shallot and garlic sautéing in the butter. The beginnings of my roux. There’s that Vermouth. 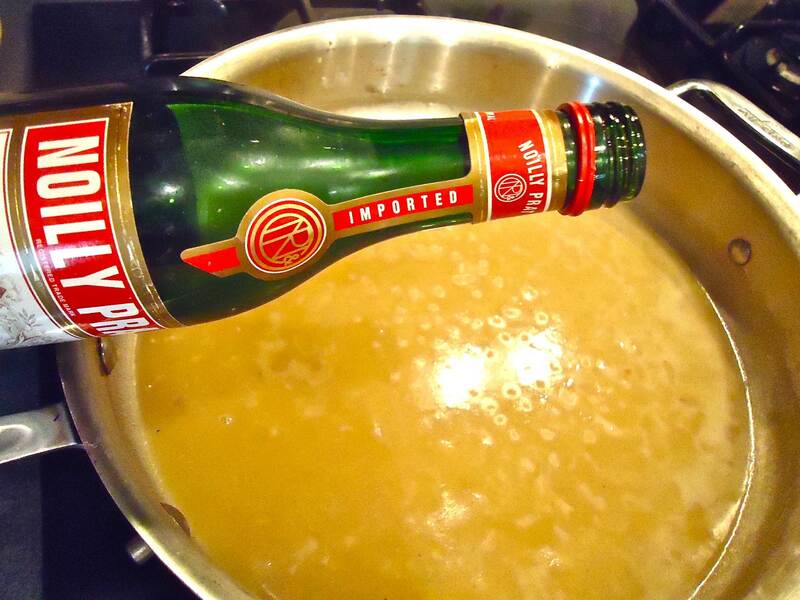 Cook for a minute or so after adding this so the flavor stays but the alcohol evaporates. My sauce is smooth now too! In go those shrimp. It will only take a few minutes for them to cook. They turn pink when they are cooked. In go the peas and the artichoke hearts. Yes, I use frozen peas – fresh would be better – but frozen was what I had on this day. Green peas are so handy to keep in the freezer. 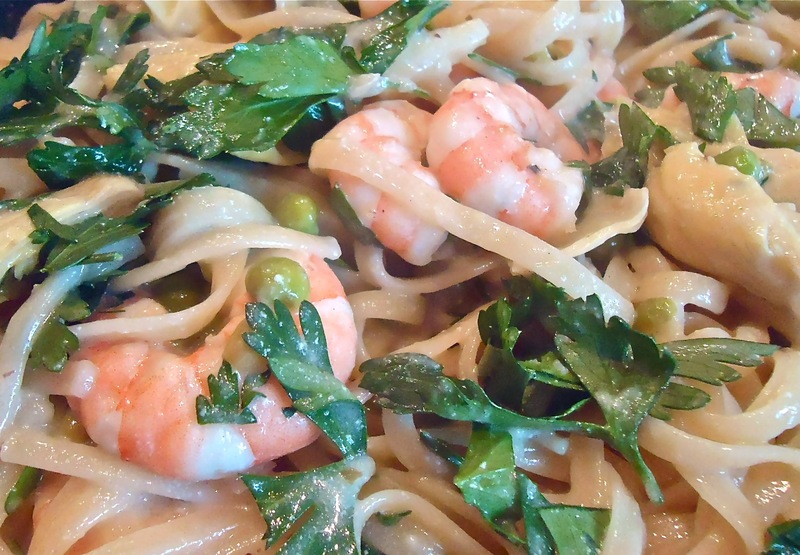 Toss the sauced shrimp and artichoke artichokes with the warm fettucine and fresh chopped parsley. Sprinkle on some Parm if you so desire! In a large pot begin heating water to a low boil. Melt butter in large sauté pan. 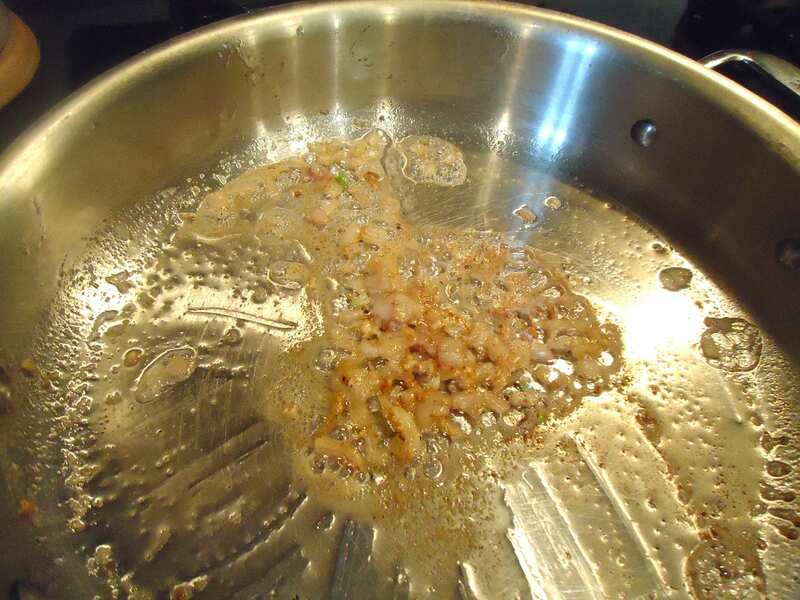 Add shallots and garlic and sauté 2 minutes. Stir in the flour and cook until smooth, about 2 minutes. Using a whisk add in the vegetable stock and continue to stir or whisk. Stir in the Vermouth and cook another minute. Stir in the half and half and the juice from the lemon. Reduce heat and cook about 1 more minute. Reduce the heat to as low as possible or set off the heat. Once the pot of water is heated, cook the fettuccine according to package instructions. Drain the pasta and set aside. You can also keep it warm in a strainer set over warm water if you like. Begin the heating the sauce mixture again. 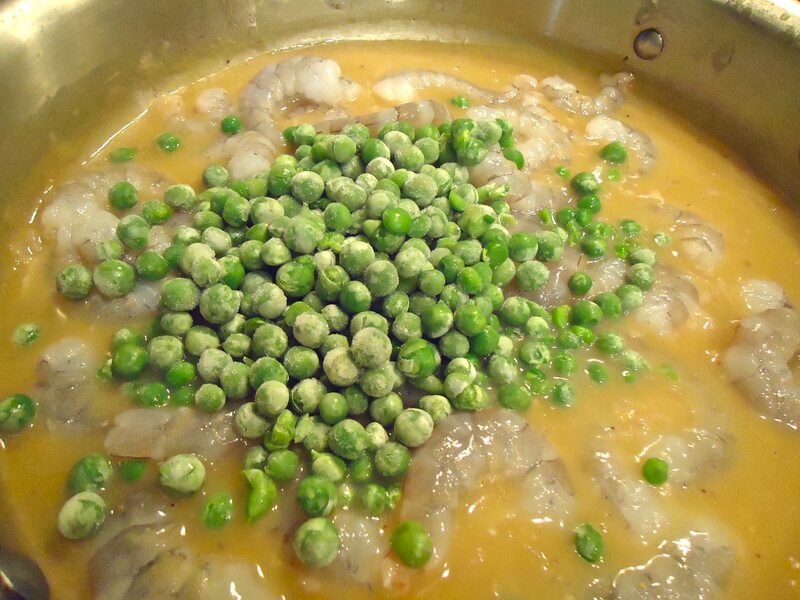 Just before it begins to bubble add the shrimp, the artichokes (don’t drain) and the peas to the mixture. 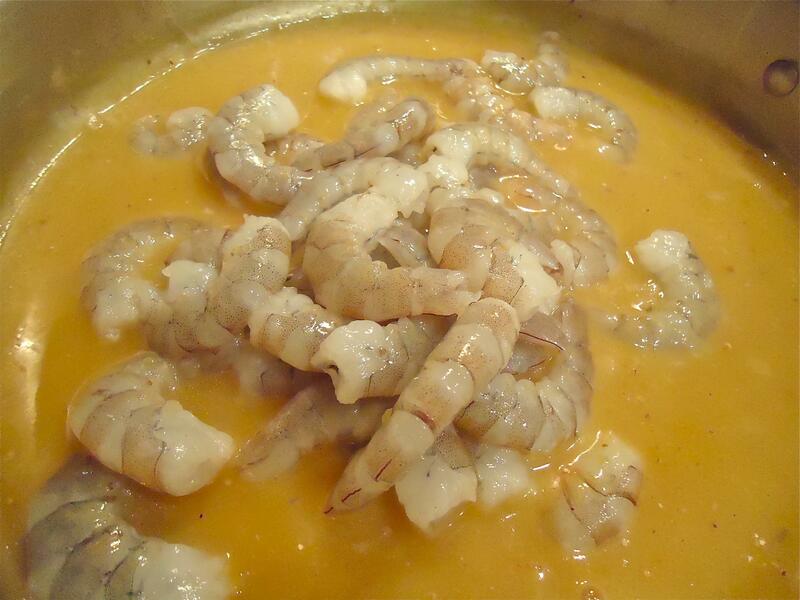 Cook for about 4-5 minutes on medium, stirring occasionally, until the shrimp are pinkish and cooked. Add salt and pepper to taste. Toss with the cooked fettuccine and the flat leaf parsley in a very large, warmed serving bowl. Serve with grated Parmesan, if desired. 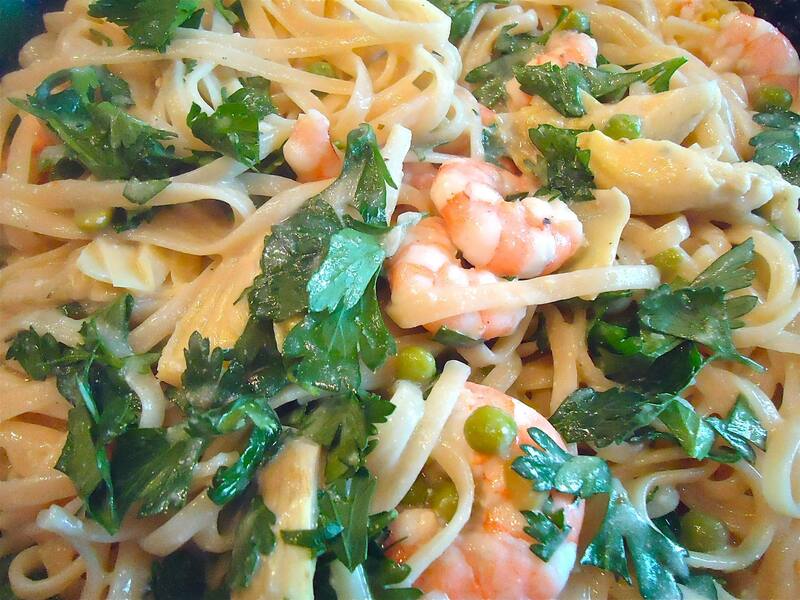 This entry was posted in Recipes and tagged fettucine with shrimp and artichoke, main dish, pasta with seafood, prawns, seafood. Bookmark the permalink.